A person’s distinct learning style depends on cognitive, emotional, and environmental factors, in addition to the person’s past experiences. So, this means that everyone is different, and his or her learning style is unique. In this article, the focus will be on the visual learner. What does the visual learner look like? What characteristics are common in the visual learner? How can the visual learner best study to achieve learning success? Let’s find out! So, You Think You Are a Visual Learner. If you are a VISUAL learner, you learn best by reading or seeing pictures. As a visual learner, you remember 75% of what you READ or SEE. 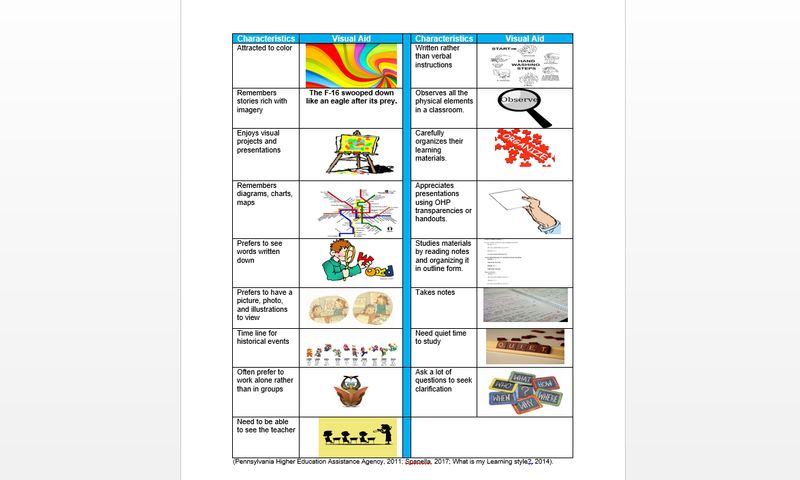 Visual learners prefer the use of images, maps, and graphic organizers to access and understand new information. You comprehend and recall things by sight. In other words, you can picture what you are learning in your mind, and you learn best by using learning strategies that are primarily visual. You often close your eyes to visualize or remember something, and you will find something to watch if you become bored. So, you like to see what you are learning. (Pennsylvania Higher Education Assistance Agency, 2011; Spanella, 2017; What is my Learning style?, 2014). Pennsylvania Higher Education Assistance Agency (2011).